If your device is connected to the internet, there is always a risk of cyber threats, such as malware varieties, types of viruses and other threats that aim to infect your device. In addition, if your computer or smartphone has started to act weird, you have noticed slowdowns and interruptions, there is always a chance that you might be dealing with malware. 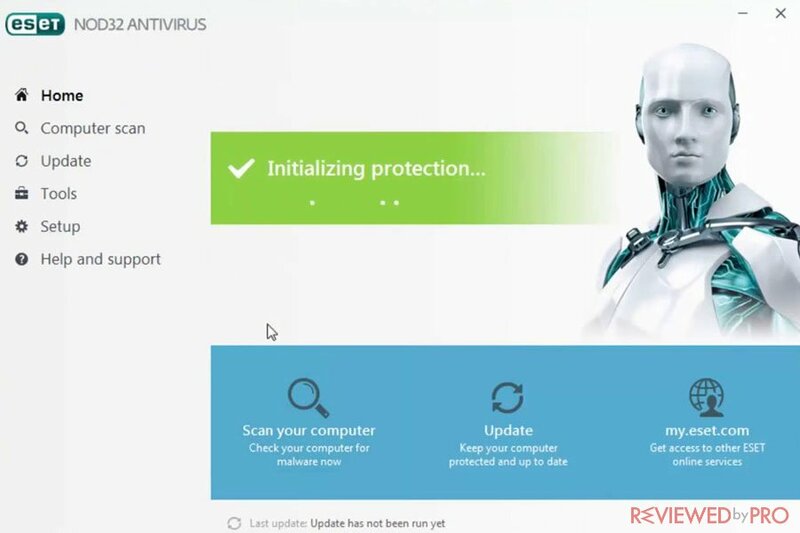 Even though it could get hard for you to choose the antivirus providers, Reviewed by Pro constantly tests new products in order to provide you with up-to-date information and reviews of the latest Internet security and antivirus applications, privacy solutions, recovery tools, and other utilities. If you struggle in choosing between Malwarebytes and ESET, continue reading this article, as it will reveal some of the main features of these two products. Which is better – Malwarebytes or ESET? If you do not have time to read the entire article, the table below provides you with the main features we tested and one winner. The features include offerings, antivirus rates, additional features, performance rates, and popularity among users. Malwarebytes offers lower prices for its paid plans. Malwarebytes demonstrate slightly better malware detection rates. ESET has a wider selection of security features. ESET demonstrates better performance rates. ESET is a full-featured tool, while Malwarebytes focuses on antivirus protection. Malwarebytes has a bigger market share in the industry. Malwarebytes is one of the most popular anti-malware applications out there. this anti-malware tool was first released in 2006, but various updates are still coming regularly to this day. The company provides home users with anti-malware protection across all the major operating systems including Malwarebytes for Windows, Malwarebytes for Mac, and Malwarebytes for Android. In addition, Malwarebytes offers Malwarebytes Premium that is capable of protecting small offices, teams, and startups. ESET has been known for its quality products for a while. The company was established in 1992 and has been awarded to be the best Slovak company three times. ESET is well known for its innovative and comprehensive security and antivirus products for both business users and individual users. Malwarebytes offers Malwarebytes Free and paid Malwarebytes Premium for a single device and Malwarebytes Premium for Home for up to 10 devices that can be mixed and matched. Once the software is downloaded and installed Malwarebytes provide users with a 14-day trial of the full version. ESET offers a variety of products for Windows devices. As you can see, ESET has wide offerings and longer trials. 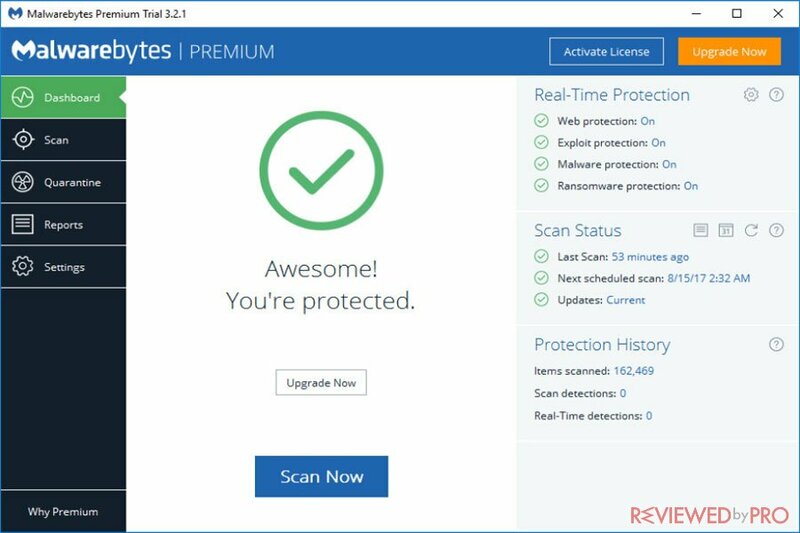 Malwarebytes provides users with a free version of the application that scans the system for malware, viruses and other similar cyber threats and PUPs, and cleans infected devices. Malwarebytes Free complements antivirus, while Malwarebytes Premium is able to replace antivirus. Malwarebytes Premium and Malwarebytes Premium Home (up to 10 devices) can replace antivirus software and can be mixed and matched between Windows, Mac, Android, and Chrome OS. It also ads adds anti-malware and anti-ransomware features, protects from malicious and fraudulent websites, stops malware that decreases computer performance, cleans up infected computers, and protects Identity and Privacy from hackers. ESET NOD32 offers a limited feature set and covers basics, such as Anti-Phishing, Exploit Blocker, UEFI Scanner, Ransomware Shield, Free Support, Script-Based Attack Protection, and others. Malwarebytes, just like the majority of its competitors, including ESET, uses advanced technologies to detect both, widespread and zero-day malware samples. 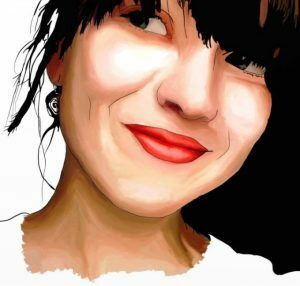 They both apply a traditional signature matching engine and heuristic monitoring. All of the detected suspicious icons are sent to the companies’ servers for further examination. Malwarebytes is a powerful anti-malware tool, so we expected better detection rates. It’s antivirus engine managed to detect more than 98% of malware on our test computer. We have also compared our results with the results from AV-TEST. However, Malwarebytes’ antivirus protection was rated only 5.0 out of 6.0, as the program detected 99.2% of zero-day malware attacks, including web and e-mail threats, and 99.7% of widespread and prevalent malware. When it comes to ESET, the antivirus did not participate in the most recent, but in the previous tests, ESET NOD32 detected 98.9% of zero-day malware attacks and 100% of widespread and prevalent malware. In this case, it is hard to tell about ESET’s detection rates as it has not been tested in the most recent tests. However, as we can Malwarebytes demonstrate slightly better detection results. As we tested Malwarebytes on our test PC, the tool had a relatively heavy impact on system-performances and can cause lags and interruptions. The application uses more system resources than most of the antivirus products and had an impact of 30% on our test computer which is more than the industry average. 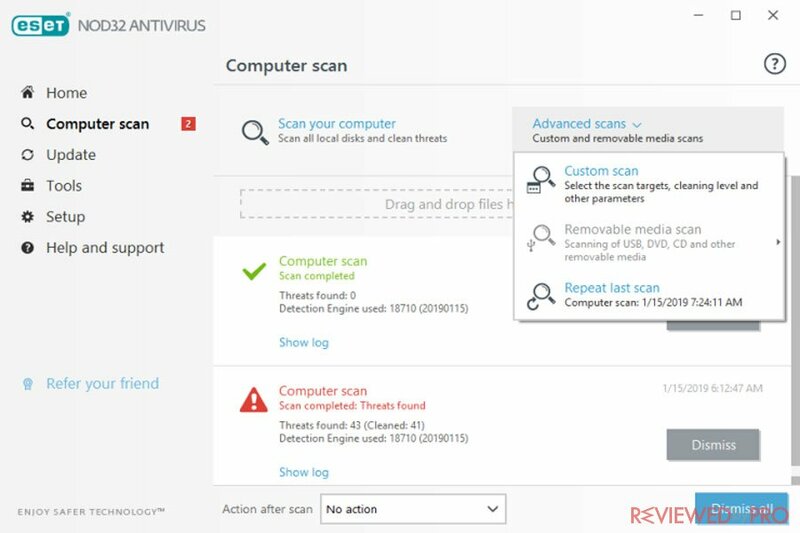 We have also checked how Malwarebytes was tested by AV-TEST. The independent testing lab rated the antivirus system’s performance 5.0 out of 6.0. Impact on a system when launching popular websites – 14% (19%). Impact on a system while downloading frequently-used applications – 0% (1%). 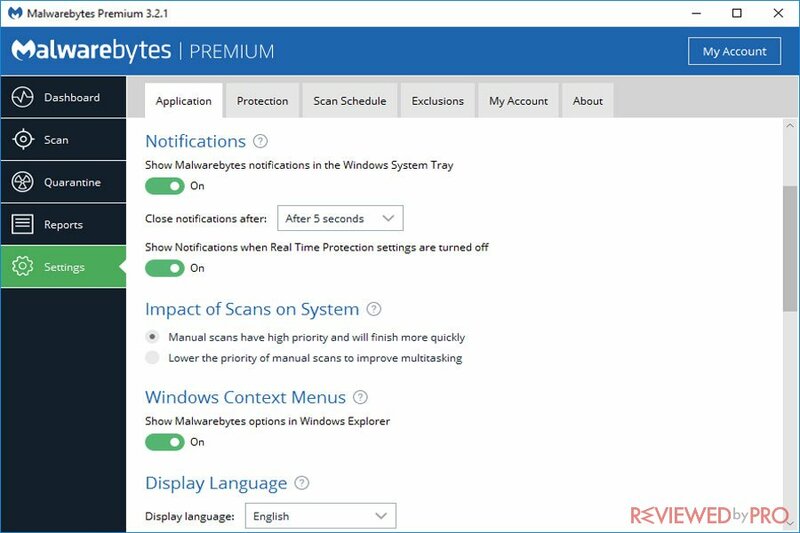 Malwarebytes Anti-malware offers users quick and stable scans. The application offers users three types of scans, including the full system scan or the Threat Scan, Custom Scan and Hyper Scan. When it comes to ESET, ESET is not a market leader either. The boot time takes a few seconds longer than the competition average. However, it won’t drown your system resources when ESET is running in the background, nor will it cause any problems when it runs a full system scan, as it takes up no more than 9% of RAM memory. We have also checked AV-TEST results and noted that ESET demonstrated a pretty heavy impact on the system. Worth mentioning that ESET did not participate in the most recent test, so the data is taken from the previous tests. Impact on a system when launching popular websites – 8% (13%). The scans are also stable and very accurate. To sum up, ESET demonstrates better performance rates and has a lower impact on system performances. When we used Malwarebytes, we noted that at the first sight the tool can seem a bit complex, as it hosts of status details, multiple icons, assorted buttons, and five tabbed areas. However, once we used it a bit more, the program became very intuitive and simple. In contrast, from a very beginning, ESET seems very convenient to use. The tool has an easy navigation system and even though the text is relatively small on some of the settings and options, we had no problem while using the software. In this case, we can say that ESET was designed to be used by both, beginners and advanced users and is very intuitive and clear. We also have checked which one of the programs has a bigger market share. According to OPSWAT’s streamlined Windows Anti-malware Market Share Report, Malwarebytes appears in third place and takes 12.23% of the market share and ESET has about 9.09% of the market share. Other popular products in the latest OPSWAT report include tech giants such as Avast, McAfee Inc., Bitdefender, Webroot, Kaspersky Lab, Safer Networking Ltd with SpyBot Search & Destroy, Avira, and Symantec with Norton. What we found out after using the software, Malwarebytes Anti-Malware is created for every user – whether you are a businessman, a CEO of a large company or an individual user. This application will protect your computer not only from the usual malware, but from ransomware, infected sites, and various small threats. Malwarebytes is a great anti-malware software and worth its price after all if you need real and reliable protection against the latest threats on the Internet. When it comes to ESET, the programs is a very decent choice for those who look for advanced malware protection, long and useful feature set and a great navigation system. It is a great choice for those, who look for flexible plans and trustworthy security and privacy features. According to our test and the independent testing lab test, AV-TEST, ESET demonstrates better malware detection and performance rates. It also has easy to use and clear interface and a variety of features. When it comes to Malwarebytes, the Anti-malware tool is limited to protection features and can work great alongside other security software. Even though ESET wins this batter, if you want to fulfill your security, you can get both. Malwarebytes works great along with other security suite and provides an additional layer of security and anti-malware protection. The table below summarizes our test results. If you are still not sure which program to choose, our researchers constantly test and review different security applications for Windows, Macs, and Android devices. Check out our Security section and choose the right solution for you! ^ Malwarebytes Home Products. Malwarebytes. ^ ESET Windows Products. ESET. This entry was posted on 2019-02-19 at 03:45 and is filed under Security.